Yesterday (Friday 5 January 2018), my Windows 10 system automatically downloaded and installed a patch to “fix” the recently discovered ‘Meltdown’ vulnerability. But as soon as Windows re-started, my TradeStation stopped working! TradeStation had put around an email warning this might happen on Thursday, so this wasn’t unexpected. What I hadn’t appreciated was that Windows 10 now installs all updates and patches automatically, by default, and it’s not obvious how to stop auto-updates in the Windows settings. Stop Windows 10 auto-updating: Type ‘Run’ into the Windows search box > Click on Command Prompt > Type ‘services.msc’ and press enter > Scroll to the bottom of the Services list, right click on Windows Update and select Properties > Under the General tab, change Startup Type to Disabled > Re-start Windows. Rollback the latest Windows 10 patch: Go to Windows Settings > Search for ‘Update’ > Click on Windows Update Settings > Click on View Installed Update History > Click on Uninstall Updates > Select KB4056892 and click the Uninstall button that appears above > Wait 30 seconds or so > Re-start Windows when prompted. Re-start TradeStation: When I re-started TradeStation everything worked fine. But in the forums some users mention having to re-install TradeStation. Hopefully this will not happen to you! 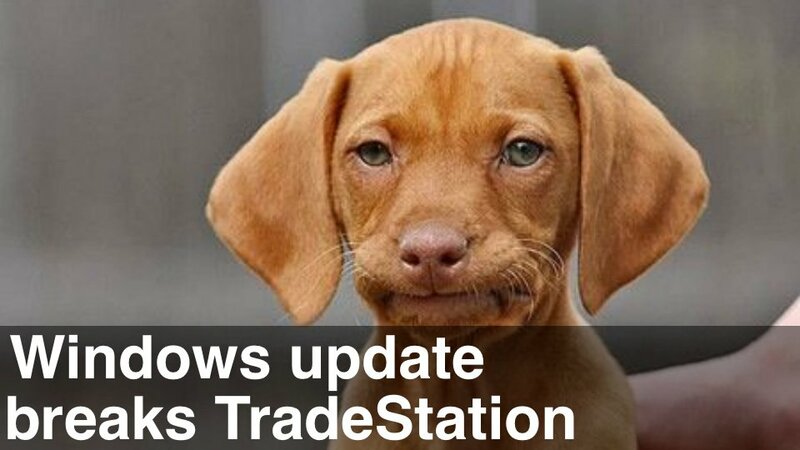 If your TradeStation is still working, your Windows system may not have updated yet. I suggest, if you’re running Windows 10, that you follow Step 1 above. If you’re running a previous version of Windows then temporarily stop installing any updates. Of course, if you don’t install the Windows patch your computer is theoretically vulnerable to a ‘Meltdown’ hack. But I’m hoping this is a temporary situation and that TradeStation issues an update very soon. And at that point Step 1 above should be reversed. Log into TradeStation’s forum and keep track of their progress on this issue by following this thread. Install TradeStation Update 23: First backup your TradeStation EasyLanguage indicators and MyWork folder. Then in TradeStation go Help > Update Manager > Make sure you have Update 18 installed > Then install Update 23. Allow Windows 10 auto-updating: Type ‘Run’ into the Windows search box > Click on Command Prompt > Type ‘services.msc’ and press enter > Scroll to the bottom of the Services list, right click on Windows Update and select Properties > Under the General tab, change Startup Type back to Automatic > Hit Apply and OK > Re-start Windows. Install latest Windows 10 updates: Type ‘Updates’ into the Windows search box > Click on Check for updates > Let Windows download and auto-install each update > Re-start Windows when prompted. Re-start TradeStation: When I re-started TradeStation everything worked fine and all my charts and indicators were still there.